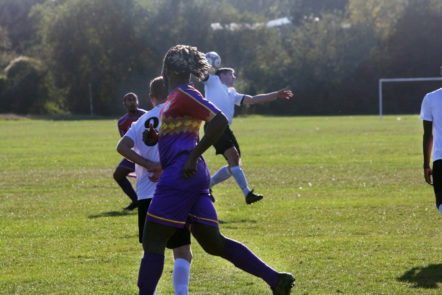 Clapton Community FC made the trip across town to Wembley on a perfect late September day to take on South Kilburn Reserves in the first round of the Jim Rogers Presidents Division One Cup. The venue, Northwick Park, could not have been more basic, with no roped off pitch, bench or even changing rooms. However, the travelling Tons fans brought their usual noise and atmosphere to the unique occasion. 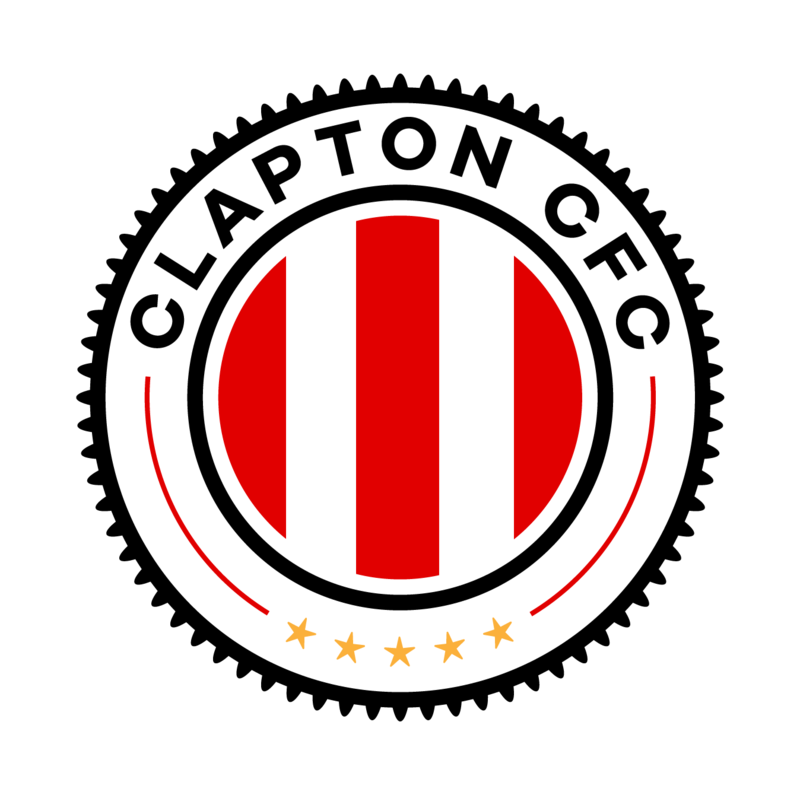 Clapton CFC player-manager Geoff Ocran made a couple of changes, including defender Ashley Headley handed his first start at centre-back for the injured captain Andrew Lastic. Today’s line-up for the Jim Rogers President’s Cup game. However, the Tons once again started slowly, with South Kilburn taking the lead within the first minute with their first attack of the game. A header across the box was tapped in out of mid air by their number 9, which left our keeper Dan Anfossy with little chance. 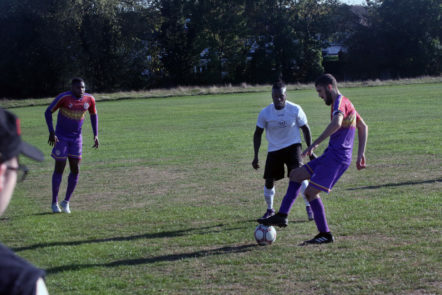 There was almost an immediate response from Clapton CFC when straight from kick-off they secured a free kick on the edge of the South Kilburn penalty box. Stefan Nielsen ploughed the initial effort straight into the defensive wall, in the ensuing scramble CCFC were able to find the back of the net, only for it be disallowed after an offside call. Before the match was ten minutes old. the Tons had two further good chances which they were unlucky to not be rewarded for. Eliot Crosbie made a solo dash across the edge of the box, beating several defenders before putting the ball. over the bar. On the next play he set up Louis Rene for a shot which also went skywards. 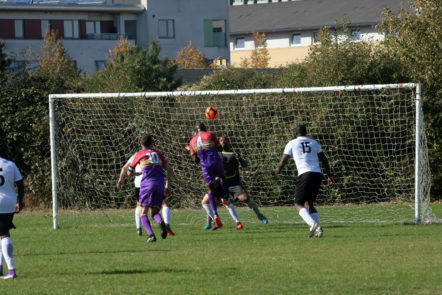 Clapton CFC continued to apply the pressure with a header striking the crossbar before bouncing off the goal line. Unfortunately, VAR technology is probably still a few years away from being brought in at this level. 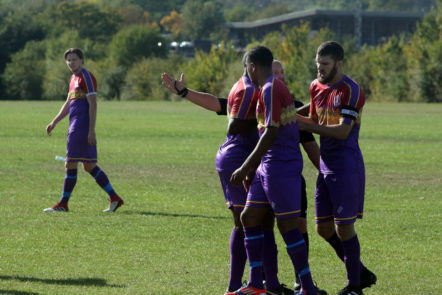 Throughout the remainder of the first half, South Kilburn had the occasional speculative run but the momentum was very much with the visitors. Chances came for Sherwin Stanley and once again for Crosbie, but they remained unconverted. 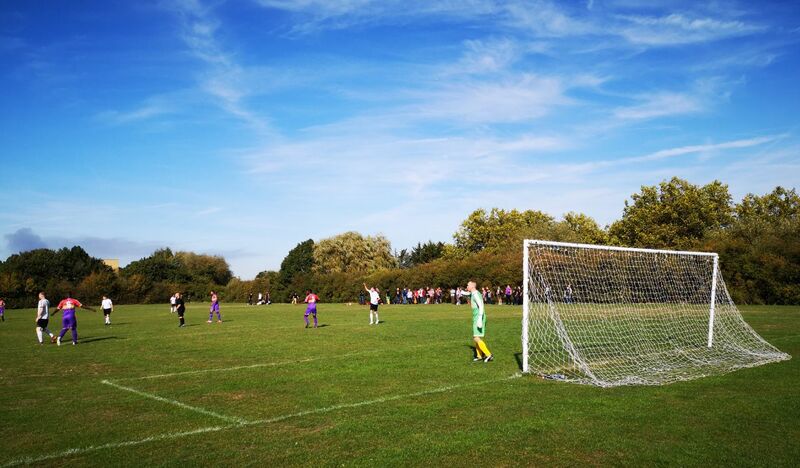 After yet another close chance the South Kilburn defence could be heard screaming for “F-ing help.” This help eventually came in the form of the half time whistle, with South still holding onto their 1-0 lead. 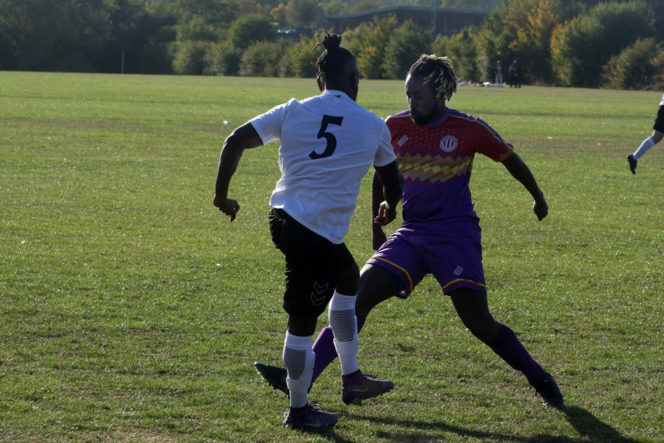 Upon the restart, Clapton CFC made what is quickly becoming their signature move, putting aside their first half worries with a couple of goals within a few minutes. 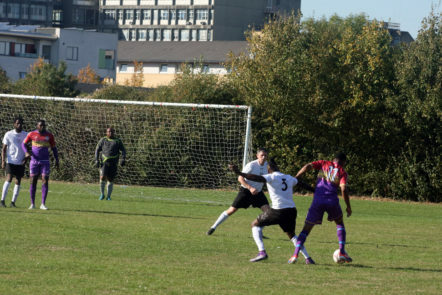 Clapton’s second disallowed goal of the match with followed by a legitimate equaliser from Crosbie. 1-1 at last. 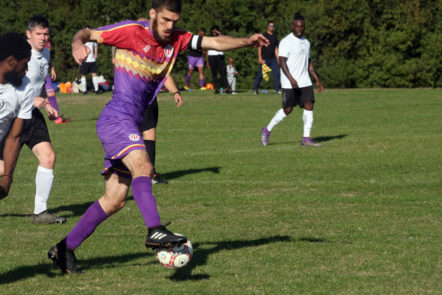 The Tons then pulled ahead two minutes later with Dean Bouho converting a chance that came through a corner kick. 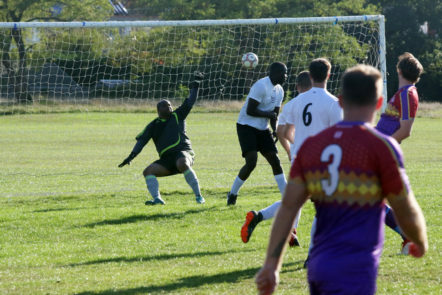 If Tons fans thought that was game over, South Kilburn had other ideas and only had to wait five minutes for their chance to pull even from the penalty shot. Their goalscorer from the first half stepped forward, but was denied his second by diving save from Anfossy to the sound of frantic celebration from players and fans alike. From the ensuing corner, Crosbie had a chance to add to his total for the afternoon with a pitch-length dash that beat the keeper who was nearly up at the halfway line but a covering defender forced him to put the ball wide. 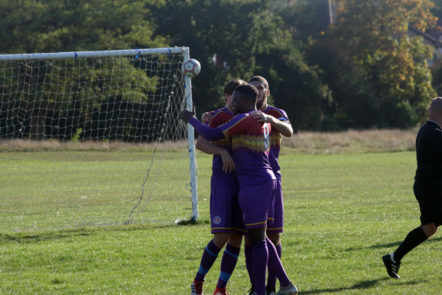 South Kilburn were still in this at 2-1 and indeed carved out several more chances, including their own disallowed goal at 78 minutes. Clapton eventually managed to get their insurance through a nice little back and forth between Stanley and goal scorer Nielsen. Five minutes later he was able to add to his goal tally when he converted a penalty to make it 4-1. He was subbed off to well-deserved cheers from the fans as he made way for Jon Akaly. 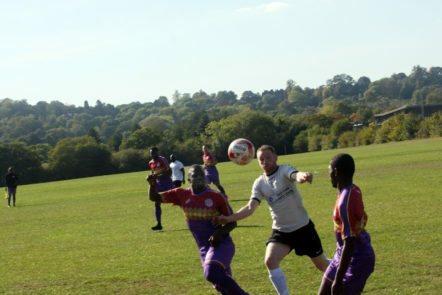 Heading into the dying minutes of the game, South Kilburn were awarded a penalty courtesy of a contentious handball. This time their goalie made his way up the pitch to take the shot, raising hopes that if Anfossy could repeat his earlier heroics an empty net at the other end was waiting. South’s keeper made sure this was never going to happen as he drilled the ball to the right, Anfossy went the right way but stood little chance of stopping it. 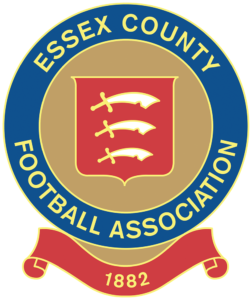 As injury time began, Clapton looked to increase their lead and had a third goal disallowed, while with seconds remaining sub Akaly was denied. At the final whistle the score was 4-2. And despite again going behind early, the Tons were clearly the stronger team and came back to win. 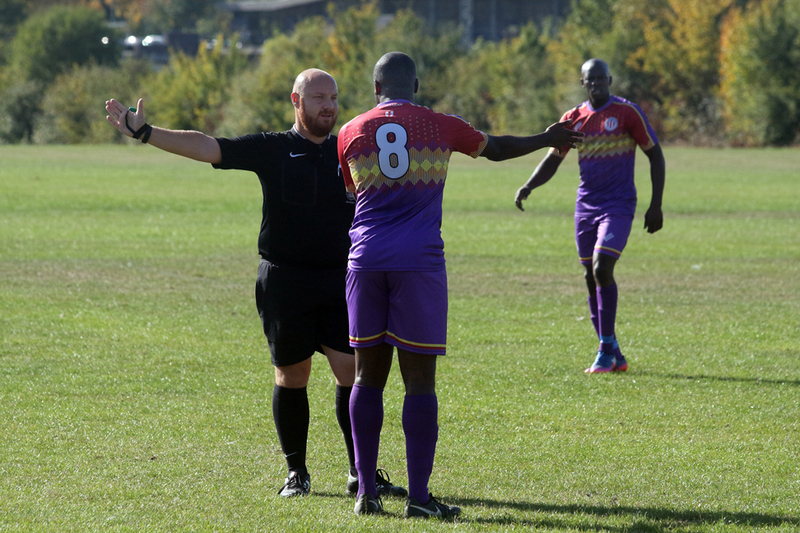 After the game, player-manager Geoff Ocran told us: “I didn’t think we played too badly in the first half. It was a lapse of concentration at the back. We now move on to the next round where an away game at FC Deportivo Galicia Reserves awaits (unfortunately not in Galicia). We look forward to seeing plenty of you there.